The pianist Jascha Nemtsov is equally accomplished as a soloist and an outstanding chamber musician. He was born in Magadan, Siberia and grew up in Saint Petersburg, where he graduated from a special music school and was awarded a gold medal. He then continued his musical education at the Saint Petersburg Conservatory, where he graduated with a concert diploma, with distinction. He has lived in Germany since 1992 and has since started a brilliant international career. 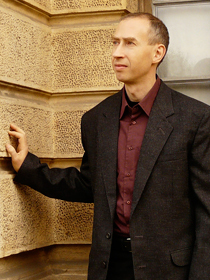 Jascha Nemtsov’s repertoire is exceptionally wide and varied: Next to the Classic Romantic repertoire (solo piano works as well as chamber music), he is especially dedicated to the music of the 20th century up to the 21st century with special emphasis on Russian music (especially Shostakovich but also Zaderatsky, Weinberg and others). In addition, he has performed several concert programmes devoted to works by Jewish composers who were persecuted by the Nazis. He is further specialized in Jewish artistic music of the early 20th century both as a pianist and as a musicologist. Nemtsov has rescued and wrested from obscurity the nearly forgotten amazing work of a whole composers’ school, the New Jewish School. Jascha Nemtsov plays solo concerts as well as participates in various chamber music formations in Europe, Israel, Canada, Russia and the United States. He has recorded 26 CDs, featuring numerous world premiere recordings and a vast spectrum of recordings from Romantic compositions such as Liszt and Raff to Turkish music (Saygun), Bartok, Shostakovich, Prokofiev and to Shchedrin and Balakauskas. “Jascha Nemtsov presents himself as a worthy descendant of Liszt and his pupils,” noted the German magazine Fono Forum, upon the release of Nemtsov’s CD of rhapsodies by Franz Liszt. Hänssler Classic released an entire series of Jascha Nemtsov’s CDs with works of the New Jewish School, which enjoyed world-wide popularity. Many of his CDs have been honoured with various international distinctions, including “Audiophile Reference – The Best of 2001,” “Klassik heute Empfehlung,” “CHOC – Le Monde de la Musique,” “Recording of the Month (MusicWeb)”, and “Disc of the Month April 2006” (BBC Music Magazine). In 2007 his CD featuring sonatas for violin and piano by Shostakovich and Weinberg, together with the violinist Kolja Blacher, was awarded the German Record Critics Prize. In 2004 Jascha Nemtsov earned his doctorate and in 2007 his habilitation. In his scholarly works he focuses on Jewish music and Jewish composers of the 20th century. The results of his research are published in several monographs and numerous other publications in anthologies, international professional magazines and encyclopedias for music. He also gives guest lectures at several German universities as well as in Austria, Great Britain, Israel, Canada and the United States of America. Since 2002 Jascha Nemtsov has been a member of the School of Jewish Studies at the University of Potsdam. In 2006 he started teaching at the Abraham Geiger College and became member of the Board of Directors and Head of the Cantorial School of the Abraham Geiger College in 2010. For the summer term 2011 he will be Visiting Professor for Jewish Music and Culture at the University of Lüneburg.